↑ Azerbaijan may be considered to be in Asia and/or Europe. 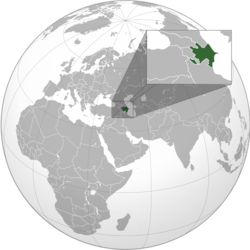 The United Nations classification of world regions places Azerbaijan in Western Asia; the Central Intelligence Agency CIA World Factbook|World Factbook CIA.gov, NationalGeographic.com, and Encyclopædia Britannica also place Georgia in Asia. Conversely, numerous sources place Azerbaijan in Europe such as the BBC NEWS.bbc.co.uk, Oxford Reference Online OxfordReference.com, Merriam-Webster's Collegiate Dictionary, and www.worldatlas.com. ↑ Reinhard Schulze. A Modern History of the Islamic World. I.B.Tauris, 2000. ISBN 1-86064-822-3, 9781860648229.